When there are lots of objects’ entrance and exit effects in the scene, and you want some of them shown at the same time, you can make full use of the effect-align feature. 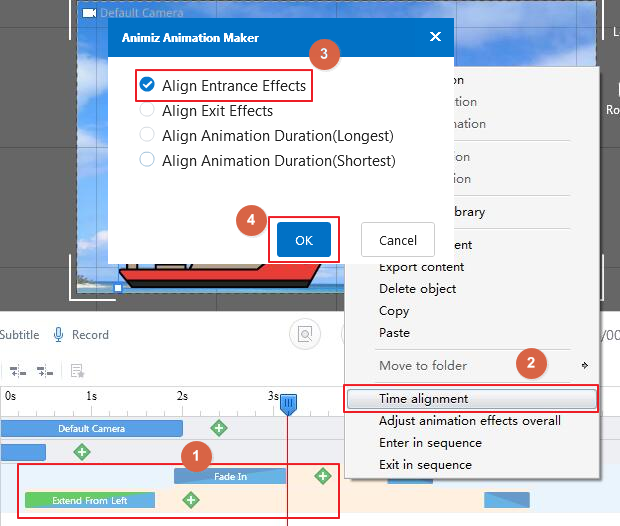 1) Click the entrance animation bar and hold the “Shift” key to select one more animation bar, and then click the “Align entrance effects” icon to align them. All of these selected entrance effects will show at the same time. 2) You can directly customize the time alignment setting to make them align. The entrance effects aligh ofter setting the time lighment. 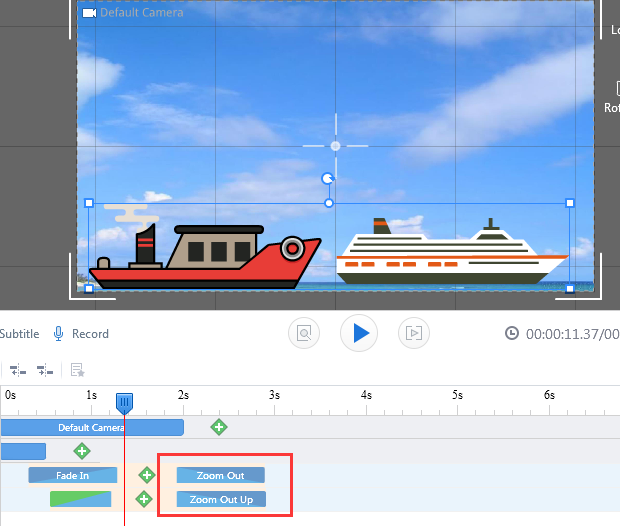 1) Click the exit animation bar and hold the “Shift” key to select one more animation bar, and then click the “Align exit effects” icon to align them. All of these selected exit effects will show at that moment when they exit from the scene. 2) You can also directly customize the time alignment setting to make the exit effects align. 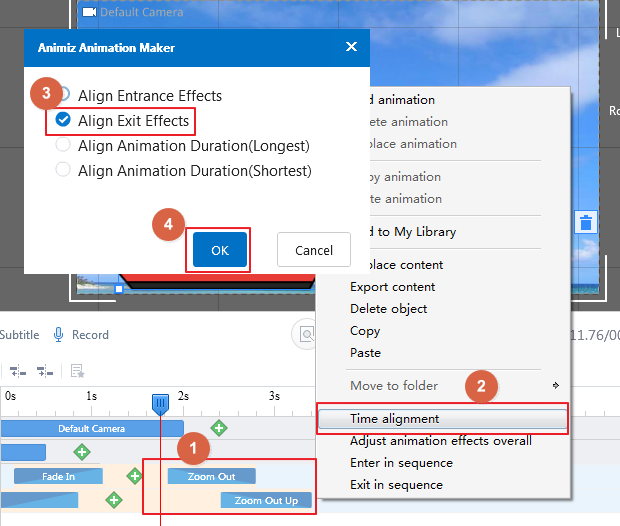 Put the mouse on the selected animation bar, and click the right mouse button, click the “Time alignment”, and then select the “Exit Alignment” option. The exit effects align ofter setting the time alignment. Previous：How to adjust different objects’ animation play order? 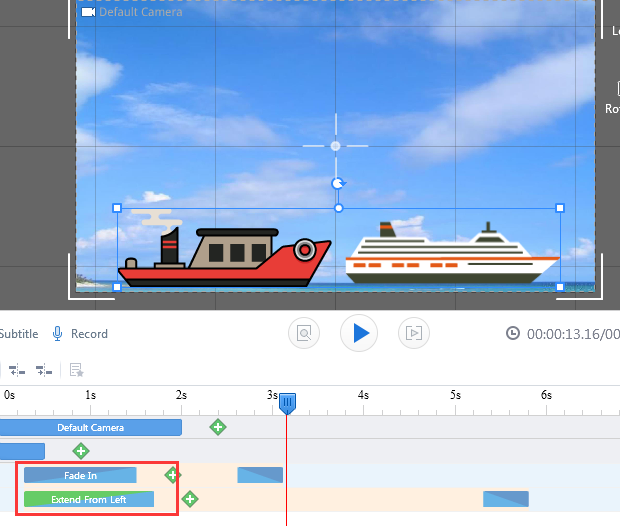 Next：How to adjust animation effects overall?